Oooh you don't remember the name/range do you? Ooh not sure if I have ever tried them before. Cute skirt! I like the bright strip color down the front. Ah, I could do with some heat .. it's so over cast here (coastal, San Diego). Girl you've got the comfy yet polished look down! Love that silky, comfy tee with the girly skirt :) I agree the Pashli holds a ton and is super durable, but I HATED the flap and clasp and had to return it :( I'm still on the hunt for the perfect work bag! I know what you mean about the clasp. I am getting to grips with it but if I overstuff the bag there is no way that I will be able to close it or even get it open. It's definitely annoying so I don't know why I like this bag so much but I really gravitate towards it lately :) Good luck on your search Alyson! That is such a great summer work outfit! Lovely as always! Love the skirt! This look is perfect for summer! :) Thanks so much for reading! Yes, the orange stripe brings something different to the skirt. It's a good choice. Thanks for sharing your outfit with us. I adore this outfit! so simple just makes such a statement with the bright orange! Oh my gosh, that skirt is fantastic! There is just something about it that is truly amazing. In love with your skirt. I have a white Pashli & it's my preferred bag for blog events as it can carry my DSLR & a spare pair of flats!! I really LOVE the skirt! Most of the time I wear skirts that are just above the knee and I tend to find skirts like this one a little bit too long (I think it makes me look older), but this is seriously such a beautiful item. I really like your look :) Great post! That skirt is gorgeous!! Great outfit! Love your outfit! 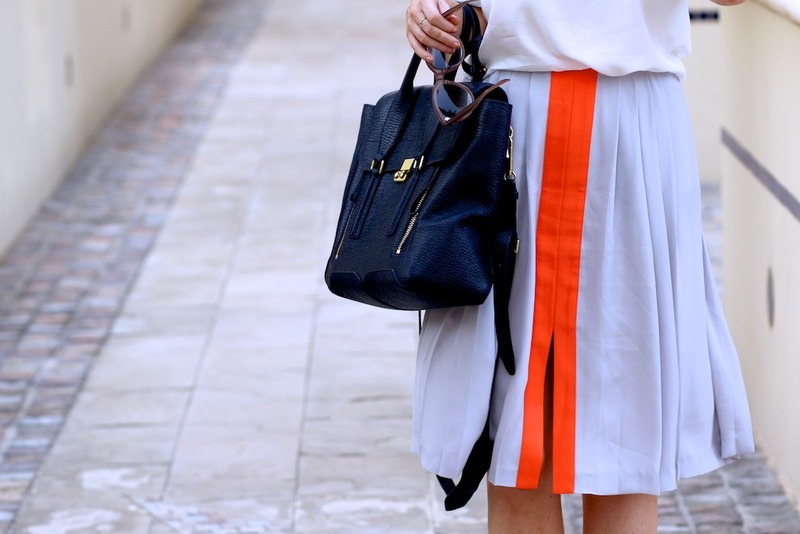 The skirt is so simple yet unusual! Thanks to you I'm now obsessed with Reiss. You look fabulous in this skirt! Red Fox Travels is a responsible group of brothers who are all taxi owners and we understand and respect the family values very well. All our Chandigarh taxi services are either driven by us or driven by responsible drivers only. We respect safety. We respect privacy. We proudly provide taxis from Chandigarh to all over india. Booking an outstation cab from Chandigarh is now easier with our user-friendly website. Just visit our website and call one of the numbers listed above. We will then guide you on the best options available for renting a car from Chandigarh. With every well-maintained car, we offer transparent billing service. We can arrange either per kilometer billing or can provide a packaged tour. From large group of travelers, to small family excursions, to honeymoon tours, we have done all and we understand every traveler’s priorities.